The discussion about the wireless spectrum crunch can be hard for the average citizen to follow. While it’s easy to understand the straightforward fact that every network has a capacity limit, it’s not so easy to understand how trends in wireless device utilization stress network capacity, let alone how the limits of wireless networks compare to those of wired networks. When this topic is raised a number of rat-hole arguments immediately surface regarding the forecasts for wireless demand and the various means of expanding the supply of bandwidth on wireless networks. Finally there’s a report that addresses the fundamental issues and only the fundamentals that will help the lay person put these issues in perspective. The report is written by Michael Kleeman of the Global Information Industry Center at UC San Diego, and it’s titled “Point of View: Wireless Point of Disconnect.” The report contrasts how easy it is to add capacity to an optical network to the rather cumbersome process that’s involved in adding capacity to wireless systems. Fiber optics is an amazing technology. It can send 40 billion bits per second 100 miles down a highly engineered, beautiful glass fiber by simply using pulses of laser generated light. Need to double the capacity? No need to add another fiber; just get another color laser and send multiple colors (or frequencies) of light down the fiber. If you need more distance just add a booster to amplify the laser light and you can go thousands of miles via a medium that is protected from weather and other interference. Increasing capacity, given the limited radio spectrum, costs and constraints of smaller cell diameters and increased interference, is important in order to meet public demand. A common strategy for increasing capacity is to divide cells into three sectors, which provides more capacity but only temporary relief as the number of users continues to grow. The Federal Communications Commission recently made more spectrum available through auction. 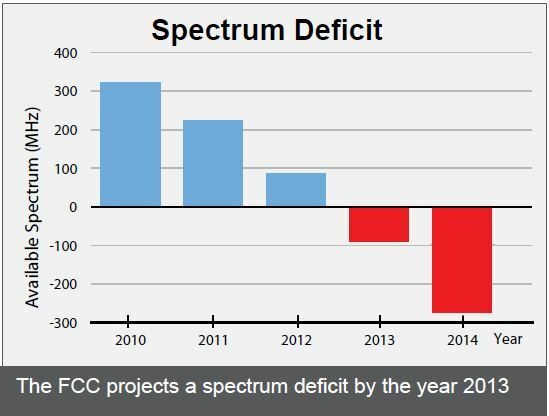 Adding new spectrum is the least expensive way to grow capacity because it can utilize much of the same infrastructure, e.g., no new towers, cell sites, generators, etc. The key insight here (which could have been made more clear) is that the cost per megabit/second of radio-based bandwidth is several times more than it is for wired capacity. In fact, the two costs are additive, as every increase in wireless capacity also requires a corresponding increase in wired capacity on the backhaul side, both new towers and new backhaul are bricks-and-mortar projects; You can’t turn on a new color if there’s no fiber on which to do it. Granted, micro-cell architectures are part of the picture, but their utility is sharply limited as they primarily serve stationary and “nomadic” uses rather than truly mobile ones. What’s driving the demand for more Internet bandwidth? Mainly it’s video streaming, as we can see on the wired side. Netflix is up to a third of Internet use in the USA during prime time, up from the fifth that was previously reported. In the mobile space, we’re also witnessing the emergence of media-rich social and augmented reality apps. So the bottom line is clear: The demand for mobile bandwidth is on the rise, but the supply is not growing nearly as fast as it needs to grow in order for the user experience to continue its arc of improvement. Rather than squabble over the details, it’s wise to increase the supply of spectrum, because more spectrum is the cheapest way to keep the supply of mobile bandwidth growing. It’s also worth noting – although the report doesn’t do this – that the Internet grew from a “lab toy” into the indispensable engine of innovation and social transformation that it is – against the backdrop of cheap bandwidth enabled by rapid innovation in fiber optics. We’ve become accustomed to cheap bandwidth because that’s what we’ve had for the wired Internet, and we’ve developed expectations on both the technical side and the policy side that cheap bandwidth was going to solve all our problems. That worked out to be roughly the case. We cannot expect that technology alone will produce the same effects for the wireless Internet that we’re used to. In fact, we can very well expect that technology will not produce these effects or anything close to them. Wireless technology advances, but not at the same speed as optical has over the past 15 years. The principal driver of optical innovation is the almost perfectly noise-free channel inside the optical fiber, a channel that is largely immune to environmental noise because noise is electro-magnetic while the optical signal is, well, optical, operating at an entirely different range of frequencies than the common noise produced by the earth’s magnetic field and common transmitters. Optical fiber is a wonderful shield against noise, but air is not. And air just happens to be the medium through which radio waves have to pass. So we face a conundrum when it comes to increasing the capacity of wireless systems, which are in the same sort of place that wired systems were before the invention of optical fiber. Every increase in wireless capacity requires the equivalent of a new wire, which comes about in the form of a tower, a backhaul connection, or a frequency. Of these options, more spectrum is by far the cheapest.